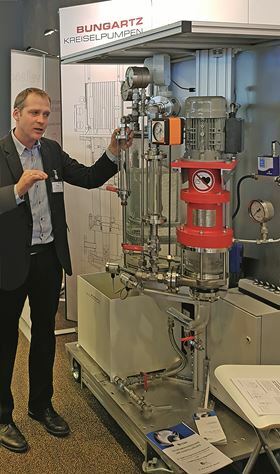 Head of sales at Bungartz, Sadko Meusel, explains the pump principle of the safe to run dry magnet-coupled vertical pump MPCV-AN. German pump manufacturer, Bungartz, will be showcasing its centrifugal pumps at ACHEMA and offering visitors the chance to operate them and check their safety and functionality at Stand C1 in Hall 8. Visitors can witness for the first time, the fast, pressureless and complete unloading of a tanker truck with self-regulating pumps. There will be a model which consists of a glass railway tank car in miniature scale to show how Bungartz’s V-AN vertical pumps can independently adapt to variable feed rates without any mechanical or electrical regulation equipment. The cavitation-free pumping processes are safe to run dry, self-venting, and have a low NPSH value. Pump functions include pumping without static head (even downstream of a vacuum and at boiling temperature), discontinuous volume flows, self-venting and 3-phase effect with large amounts of gas, the dry-running safety of a gas-lubricated magnetic coupling, a wear-free hydrodynamic seal and the complete emptying of tanker trucks and railway tank cars, without spout drag or interruption of the pumping process.